For those of you who arenâ€™t familiar with camping, weâ€™ve gathered a list of tips to ensure your first trip into the wild is as comfortable as possible.The outdoor life may take some getting used to, but once you settle in and get your hands a little dirty, youâ€™ll see that experiencing nature in its most primitive state can be one of the most relaxing and inspiring vacations you can take. For those of you who aren’t familiar with camping, we’ve gathered a list of tips to ensure your first trip into the wild is as comfortable as possible. The outdoor life may take some getting used to, but once you settle in and get your hands a little dirty, you’ll see that experiencing nature in its most primitive state can be one of the most relaxing and inspiring vacations you can take. * For starters, don’t commit to too long of a camping trip unless you feel you’re truly prepared. 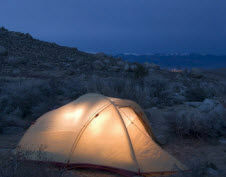 While some love to camp for several days at a time, a night or two might just be enough for you. * Look into designated campgrounds. At places such as Yosemite National Park, campers can reside in some of the lodges that are composed of several canvas tents provided by the park. These areas are generally more comfortable and have running water and bathrooms for those not quite ready for life outdoors. Some of these lodges even have large cafeterias that serve casual food for campers. * While sleeping bags are the usual staple for campers, many companies now make portable air mattresses that come with self-inflating pumps to make set-up a breeze. Never fear — read more of our camping tips for first timers at Tours4Fun's blog.